My daughter is high school class of 2023 so we have a while. Lol. Anyone on here have a child sign a letter of intent to play at the next level today? Would love to offer my congratulations! All this talk on this website about youth soccer and nobody on here had a kid sign a letter of intent today? It’s rare that people come on this forum to give specifics on their kids committing. Not gonna try and explain it. It’s just the way it is. They leave that up to Twitter, Facebook, Instagram, the local papers, TDS, & Soccerwire. I would think it would be the one time that we could all be happy for some kids that worked crazy hard to achieve a dream! Put aside our petty differences and celebrate some kids' accomplishments! The forum was designed to sell a product. Either tournaments or pay to play. It's a social marketing medium. So people are afraid if we celebrate their child’s accomplishments we might figure out who they are? Lol. There is a list of ECNL signees in the attached link. Congrats to all of the players who were selected for a college team. 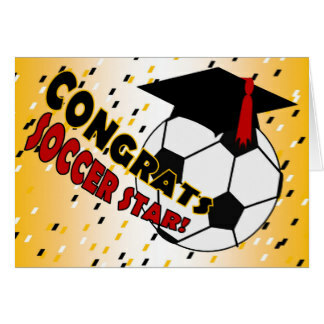 that would be nice to see which North Texas soccer player signed and what collage, I think everyone would be happy for them.. since they worked hard and achieve their goal. 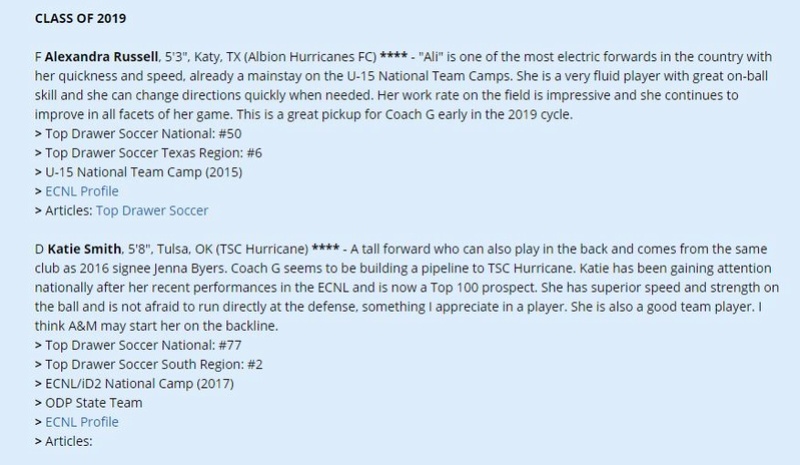 These lists cover DFW signings and aren't limited to just the DA & ECNL kids. The DMN list is organized by sport and covers mostly East side of DFW. Star Telegram is by high school, so you have to dig a little more, and covers mostly West side of DFW. 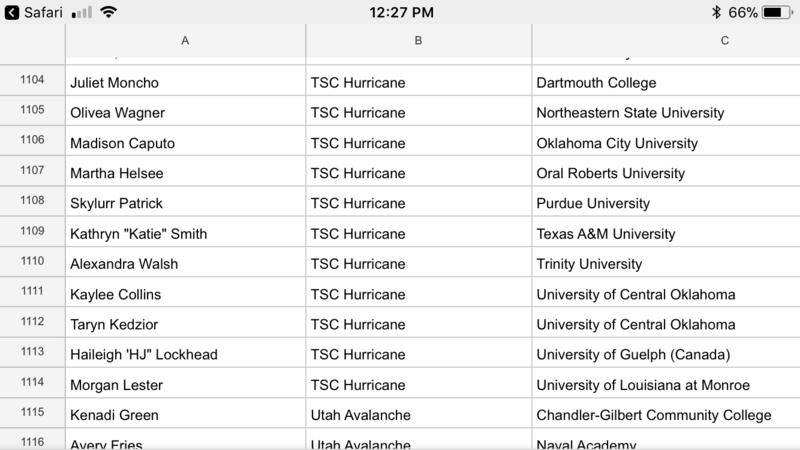 DeltaTauChi wrote: These lists cover DFW signings and aren't limited to just the DA & ECNL kids. The DMN list is organized by sport and covers mostly East side of DFW. Star Telegram is by high school, so you have to dig a little more, and covers mostly West side of DFW. OkieEnergyDad wrote: I would think it would be the one time that we could all be happy for some kids that worked crazy hard to achieve a dream! Put aside our petty differences and celebrate some kids' accomplishments! OU and OSU didn't sign any 2018's from in-state and Tulsa only signed 1? That seem's a bit surprising. Okie - there are two lists there. Look at the second (Top Drawer) and they do show those. Some schools don’t allow “signing days”. Thanks! The Top Drawer is a much better list! All of A&M's recruiting class are early enrollees. They signed 5 girls that are all on campus already practicing. There must be confusion with Katie Smith making a verbal commit vs. actually signing a LOI. Is Katie graduating next year? She signed its on the ECNL website which is where the posting is from. I doubt they make it up. 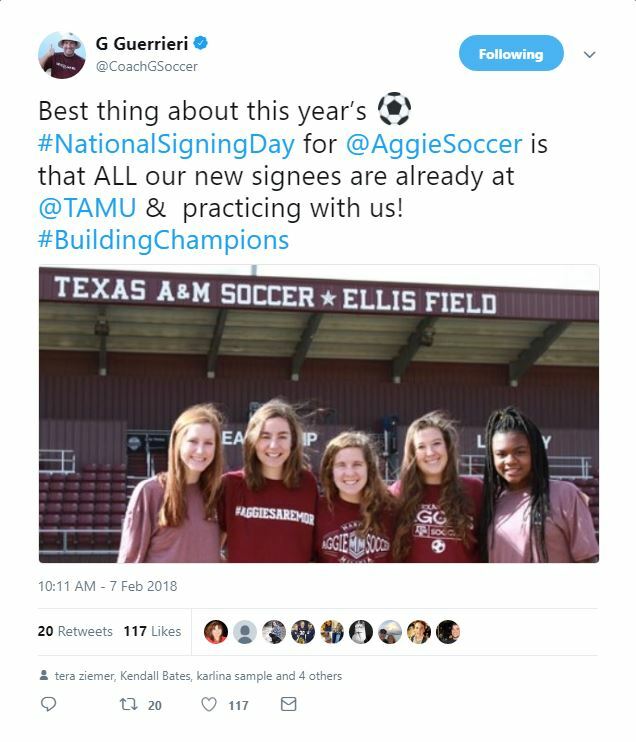 There is literally no information on the A&M website or Coach's twitter about signing Katie Smith yesterday. I really think there is some confusion. Maybe a different A&M? There is Corpus Christi? Playing D1 is great but what I liked were the educational institutions some of the players got into. I looked around. The ECNL website is incorrect. Katie is class of 2019. She has verbally committed to Texas A&M but she did not sign yesterday.